Skies were grey with the early morning mist as Balmoral pulled away from Anderston Quay, Waverleys Glasgow headquarters, for Waverley Excursions fifth planned sailing from the heart of Scotlands largest city to Oban, the gateway to the Hebrides (the Islands on the edge of the ocean). Balmoral had operated the first of these cruises (in May 1994) but it had to be terminated at Campbeltown due to a crack developing in a cylinder liner of the veteran motor ships Sirron diesel engines. Paddle steamer Waverley had operated the next 3 Glasgow  Oban sailings  in 1995, 1998 and 1999. All three of those sailings had been operated in glorious, sunny weather. Waverleys extended renovation in Spring 2000 gave the opportunity for Balmoral to re-visit the Hebrides and to add 2 new ports of call to the list of places that she has visited in her 51 years, especially the 14 years under Excursions management. Sailing down the River Clyde that morning we passed many of the features noted in the earlier report Through the Kyles of Bute to Tighnabruaich. Notable that day, however, were the first shafts of sunlight illuminating the large stone obelisk on the rocky fortification of Dunglass. 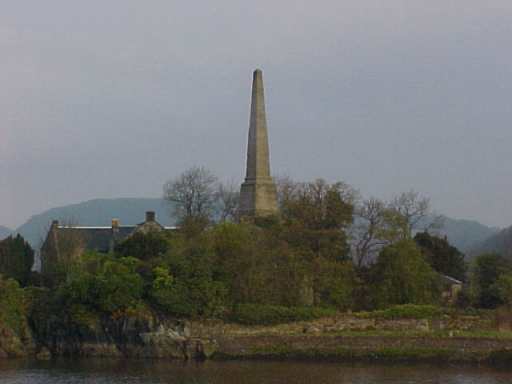 The monument, together with another polished granite structure, on the Helensburgh foreshore, were erected by public subscription to commemorate the contribution of the towns baths owner, Henry Bell. He ran the first commercial steamship in Europe down the Clyde from Glasgow to Greenock and Helensburgh in August 1812. She was named Comet and was effectively the first in a long line of Clyde paddle steamers, of which Waverley is the sole survivor. 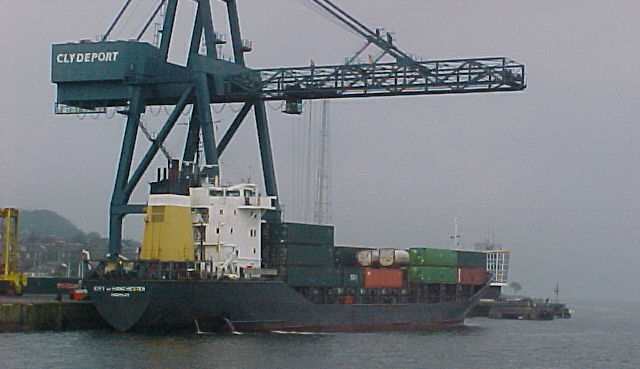 At Greenock Ocean Terminal we passed the small container ship City of Manchester, registered in Douglas. She wore the colours of the once vast Ellerman shipping line. The City Line, arguable the most famous division of the Ellerman group was founded by Glasgow based George Smith & Sons. All of the early City line steamers were built on the Clyde and were registered in Glasgow until the Ellerman takeover. As Balmoral approached Largs the sunshine finally dispelled the mist and we knew that we that another good Hebridean tour was in prospect. After Largs we had just over 100 people aboard for the next stage of the sailing. Captain Graeme Gellatly took the ship through the Tan, the channel between Great and Little Cumbrae, round the northernmost and down through the Kilbrannan Sound to Campbeltown. From Campbeltown, Balmoral continued her steady progress through the Sound of Sanda and on to famous Mull of Kintyre. 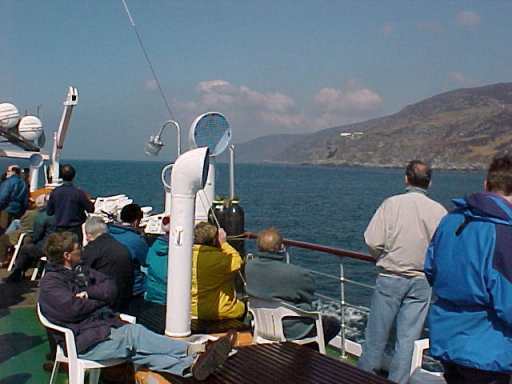 By then the skies were blue, and the strains of Paul McCartneys classic song about the area played over the Tannoy as passengers photographed the lighthouse perched on the cliff. 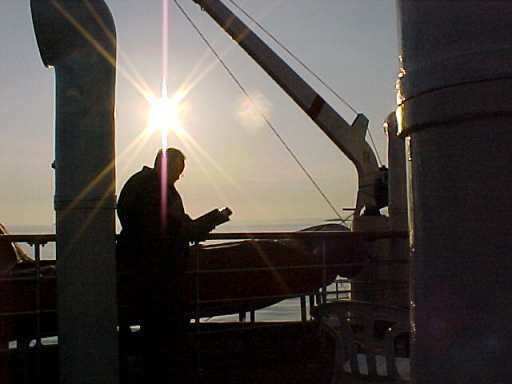 The timetable indicated that Port Ellen on Islay to be our next port of call but Capt. Gellatly had obtained agreement of the MCA that a redirection to Gigha, allowing the vessel to remain within 6 miles of land at all times, would eliminate the requirement to comply with new the new passenger registration requirements that had come into force in January 2000. So Balmoral headed north along the western shore of Kintyre and circled in the Sound of Gigha to approach the islands traditional mailboat pier  now only used as the overnight berth for the Calmac ferry Loch Ranza - from the north. 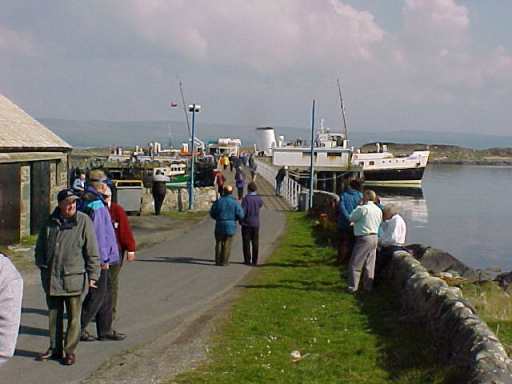 As usual passengers flocked ashore to photograph Balmoral at the pier although it was not the vessels first visit to Gigha  she had called once before on a sailing from Oban. However, this was her first call in Campbell colours  sufficient excuse for a nutters photo call. 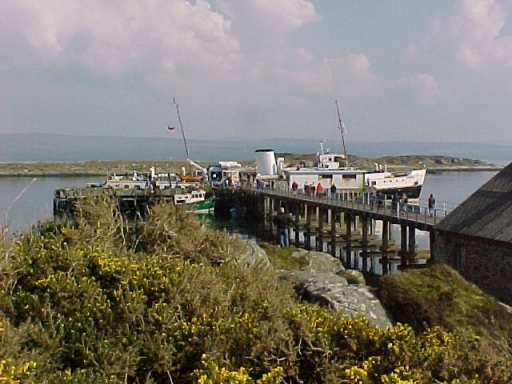 Gigha is one of those places that Balmoral has visited but Waverley has not. After 20 minutes Balmoral came away astern from Gigha the turbulence from her screws stirring a large school of dolphins to perform acrobatics around the ship for 5 or 10 minutes much to the delight of the passengers. It was hot, sunny and the crystal clear water almost convinced us that we were sailing off an exotic tropical island. 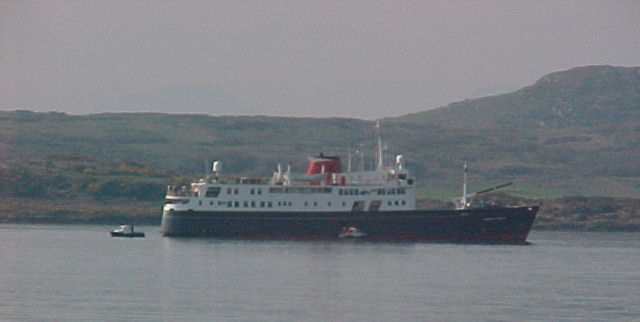 Balmoral was the third passenger ship to visit Gigha that day  apart from the normal ferry, the luxury cruise vessel Hebridean Princess was landing passengers in her own launches at the ferry slip. It was interesting to note that the ship had only recently left Great Yarmouth where she had berthed close to Waverley for most of the winter. To complete the scene Cal Macs Isle of Arran was crossing from Port Askaig to Kennacraig ahead of us. Balmoral continued up the long broad Sound of Jura holding closer to the mainland shore than Waverley has done previously when sailing from Port Ellen. As we reached the top of the Sound, Capt. Gellatly took an interesting diversion through Corryvreckan, the whirlpool gulf between the north end of Jura and the island of Scarba. 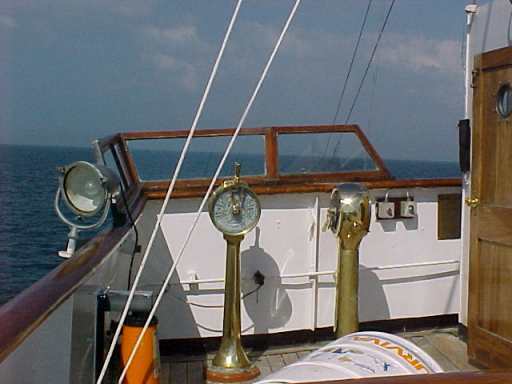 The weather was glorious  sunshine and flat calm seas. 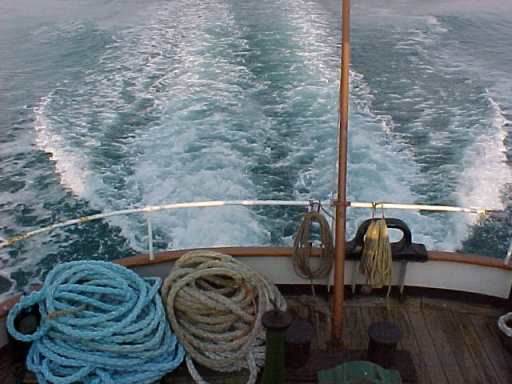 Corryvreckans tempestual swirling streams were almost undetectable. Very unusually we encountered another ship in Corryvreckan, passing the Scottish Fishery Protection Agencys cutter Norna most likely en route to the service base at Greenock. Through Corryvreckan, Balmoral passed up the east side of the deserted Garvellach isles, through Insh Sound and into the Sound of Kerrera. At 2045 she berthed at Oban North pier for the first time in 6 years (although she has visited Oban Railway pier in 1999) just as the sun dropped behind the mountains of the Island of Mull producing one of those spectacular sunsets for which Oban is famous. 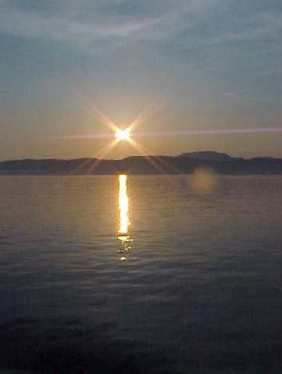 A perfect end to a spectacular sail from the heart of Glasgow to the gateway to the Hebrides. 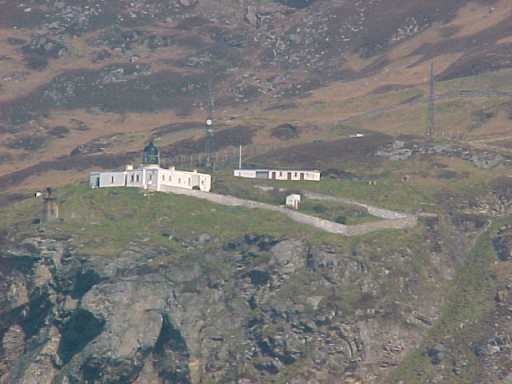 The lighthouse at the Mull of Kintyre perched on the rocky cliff.